The 2018 Tahoe Adventure Film Festival debuts at its birthplace in South Lake Tahoe, on Saturday, December 8, 2017 at MontBleu Resort Casino and Spa. The doors open at 6:30 p.m. followed by the films at 7:30 p.m.
Tickets can be purchased at the MontBleu ticket office, by calling 775.588.3515, or at MontBleuResort.com. 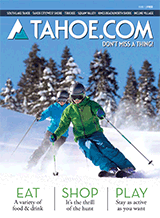 For more information and to find tickets for all TAFF shows, visit www.LakeTahoeFilmFestival.com.